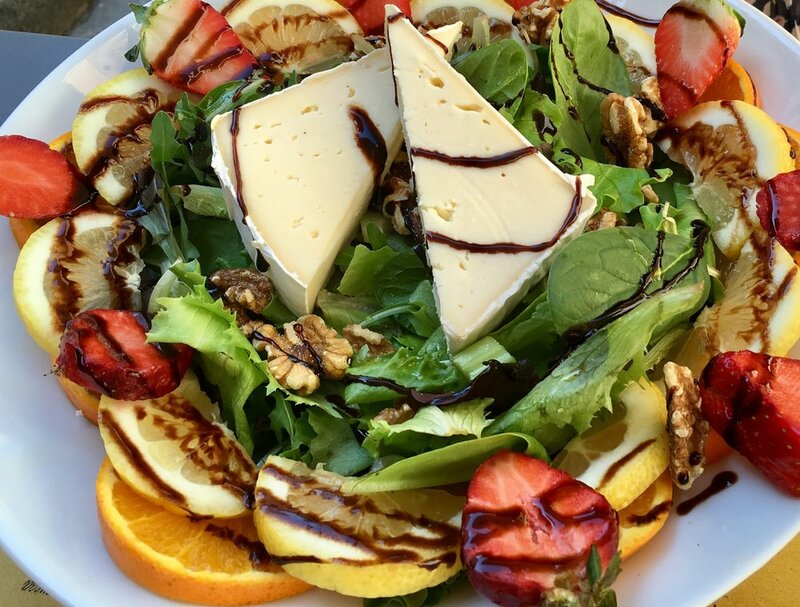 A meal-size salad with fruit, cheese, nuts and a balsamic glaze, Santa Cristina Enoteca, Lucca. Salads in Italy come in many varieties, including simple insalata verde (green salad, just a big bowl of lettuce), insalata mista (mixed salad of lettuce, carrots, tomato, perhaps some fennel), and meal-size insalatone (big salads filled with cheeses, meats, seafood, fruits, nuts). There are also delicious specialty salads such as caprese (tomato, fresh mozzarella with basil), panzanella (tomato, cucumber, red onion, basil and crumbled bread with olive oil and vinegar), and carciofi (fresh shaved artichokes with Parmesan and olive oil). All are delicious, especially when made with local fresh ingredients and eaten somewhere in Italy! I enjoy each of these types of salads but, secondo me (in my opinion), the absolute best salad in Italy is an insalata di bresaola. Bresaola is not well known in the U.S. (at least not outside of cities with big Italian communities like Boston, New York, and San Francisco), especially compared to the more familiar Italian salumi (cold cut) products like prosciutto, salami, and mortadella. I first tasted bresaola on a trip to Rome many years ago and it's always one of the first things I want to eat when I return to Italy. And, because it is low-fat and low-carb, it is one Italian food that I never feel guilty about eating. Thinly sliced bresaola, with just a hint of marbeling. Bresaola is a beef cold cut, made from what we in the U.S. would call the top round cut. It is a specialty of the Valtellina, an alpine valley in northern Italy. Like prosciutto, bresaola is produced through a process of salting and drying. But, unlike prosciutto, the beef is trimmed of all visible fat before being rubbed with a salt and spice mixture. Also, the aging process is shorter, usually two to three months. The final product is deep red in color, soft (never leathery), delicate in texture, and fragrant. It's served very thinly sliced and is so very delicious. Bresaola is typically served as an antipasto, often as a salad with peppery arugula (but also good on crisp lettuce). It is topped with shaved Parmesan and dressed with olive oil and lemon juice or balsamic vinegar. I can easily make a meal out of this salad, especially if I have some focaccia on the side. There are other ways to use bresaola as well. In a cooking class (at Lucca Italian School), I learned to fix it as an antipasto in which round slices were topped with a mixture of fresh ricotta mixed with chopped mint, folded over into half moon shapes, and drizzled with thick balsamic glaze. Heavenly! Bresaola also goes well with a variety of meats and cheeses on an antipasto platter and makes a great panini (sandwich) on salty focaccia with some tomato and a soft cheese. Or just pick up a slice and eat it in your hand as a quick snack. It's hard for me to find at home, so I always eat plenty of it while I'm in Italy.